We have a wide assortment of helmets from half helmets, 3/4 helmets and full face helmets. Yep, we got ‘em! Come in an look around. 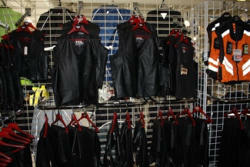 We have windshield bags, saddle bags (hard or soft), trunks and an assortment of other bags of all sizes. Motor Oil, Accessories and Parts, Parts, Parts! This is why we are your “Everything Motorcycle Store” If we don’t have it, we can certainly get it for you. 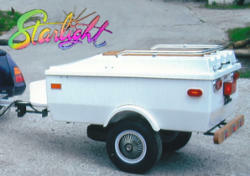 We Carry Neosho Starlight Trailers too! If you are planning a trip and need a trailer, come see us first. If you can’t find what you want, we can order it for you! 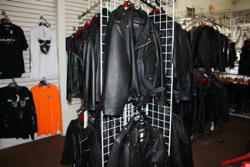 Leather coats as well as nylon riding coats are available in our clothing section of our store. You are sure find the chaps that you are looking for in our clothing section. We also have gloves, t-shirts, boots, jackets, rain suits, etc. in our clothing department. Come in a look around.